Some people will tell you that movies made by committee are what’s wrong with Hollywood. They’re wrong. Movies made by committee have always been around, and like everything else made by committee, they occasionally turn out just fine. 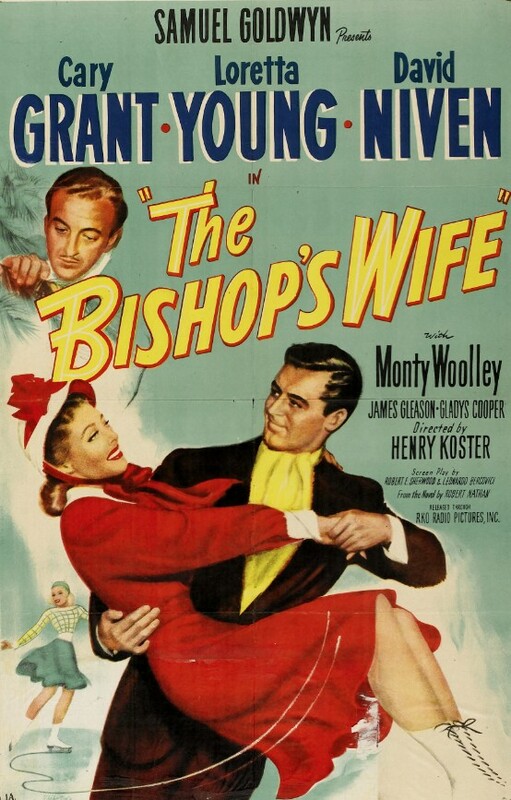 Henry Koster’s The Bishop’s Wife, for instance, is a sweet little Christmas confection. It won’t fill you up, and it will possibly leave you wanting more, but for what it is, it’s delicious. The biggest change from Seiter’s version was that David Niven and Cary Grant switched roles, but there were several other changes. 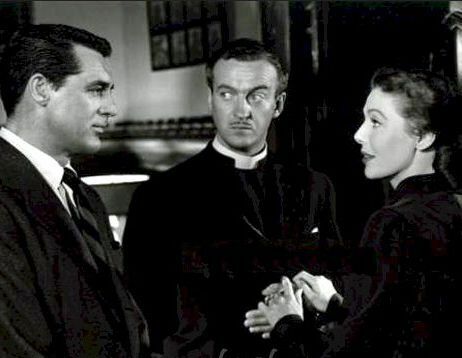 For one, Teresa Wright — who originally played the bishop’s wife — was replaced by Loretta Young. But Niven and Grant’s role-switching is the big change that everyone talks about, and with good reason. The priggish but always likable Niven is perfect as Henry Brougham, the Episcopal bishop whose cathedral-building project is destroying his personal life, and Grant is perfect as Dudley, the angel who’s sent to put Henry back on the right track. It’s as difficult for me to imagine anyone but the ageless and effortlessly charming Grant as Dudley as it is for me to imagine anyone but Edmund Gwenn as Kris Kringle in Miracle on 34th Street. Dudley shows up on earth in answer to Henry’s prayer for guidance, but he’s not an unearthly angel who waves a magic wand that sets everything right. While he can move objects with his mind, stop busy traffic on Madison Avenue while helping a blind man cross the street, and presumably do pretty much anything he wants, he mostly just puts ideas in people’s minds … good ideas that they end up thinking are their own. Dudley is also not an ethereal, androgynous angel whose feet never touch the ground. He’s Cary Freakin’ Grant, and his good lucks and charm have quite an effect on Henry’s neglected wife Julia (Loretta Young). One afternoon — after Henry’s forced to cancel yet another date with his wife due to his work on the cathedral — Dudley takes her to lunch at Michel’s, the French restaurant where Henry proposed to her. “I’ve had quite a bit of work to do in Paris,” Dudley responds. And when Dudley takes Julia’s hand to read her palm, oh how the old bluenose biddies tut-tut. The Bishop’s Wife takes place around Christmas, and it’s a wonderful holiday film. It’s also an excellent comedy, even though its broadly humorous moments are rare. Mostly its just a heartwarming, romantic, and delightful film. 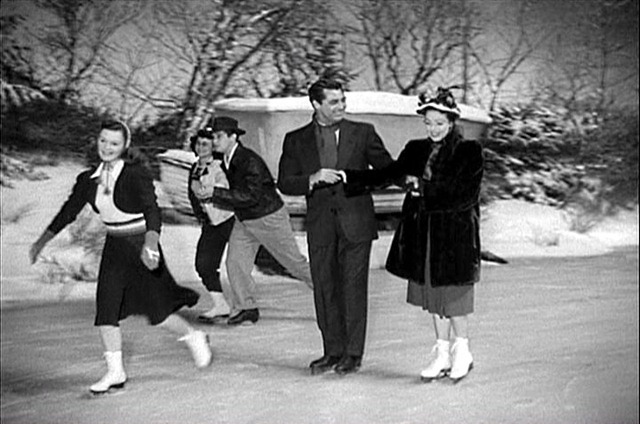 And the scene in which Dudley takes Julia ice-skating and uses his magical powers to make them both glide around the ice like Olympic champions is one of the most enjoyable bits I’ve seen in a long, long time. Posted in 1947, December 1947 and tagged Cary Grant, Comedy, David Niven, Henry Koster, Holiday Films, Loretta Young, RKO Radio Pictures, Samuel Goldwyn. Bookmark the permalink. Hey, kids, do you think “nostalgia” is only something for baby boomers hazily recalling Woodstock or Generation X’ers and their ’80s dance parties? Guess again. Unfortunately, Good News is about as convincing a portrait of the ’20s as Grease (1978) was of the ’50s. It’s a sanitized Technicolor version of the racy original, which was based on the hit Broadway play that premiered in 1927. 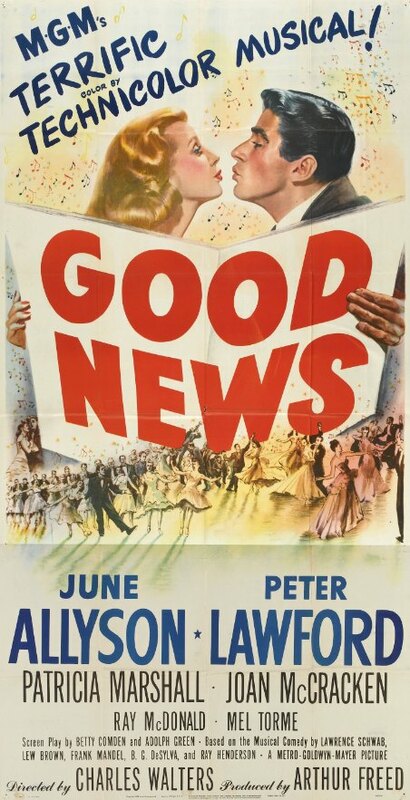 In the special features section of the DVD I watched, there were a couple of scenes from the 1930 version of Good News, and in spite of their static camerawork and unimaginative black and white cinematography they were totally and completely electrifying. Take a look at the scene below, in which Dorothy McNulty performs the song “Varsity Drag.” It’s an athletic, goofy, wild number, full of sexual innuendo and all kinds of good stuff that would be impossible to have on screen after the enforcement of the Hays Code (like the underwear shot at 3 minutes and 20 seconds). Incidentally, Dorothy McNulty later changed her professional name to Penny Singleton and starred in the Blondie movies. She was also the voice of Jane Jetson on The Jetsons. Anyway, the 1947 version of Good News just can’t hold a candle to that kind of wild vivacity. It doesn’t help that Peter Lawford, who stars as B.M.O.C. Tommy Marlowe, was cast more for his appeal as a heartthrob than his talent as a singer. He’s not terrible, but he looks uncomfortable throughout the proceedings, especially when he has to sing and dance at the same time. 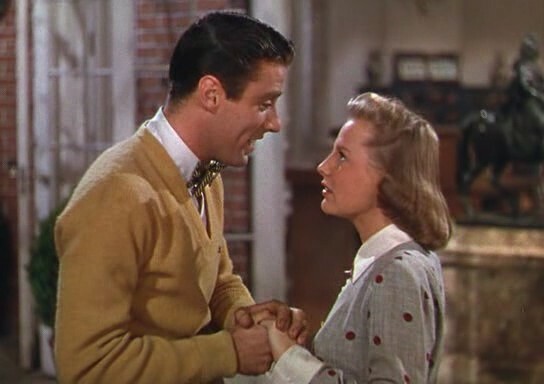 His leading lady, June Allyson, who plays shrinking violet Connie Lane, is also a bit of a disappointment, but their funny duet, “The French Lesson,” is an amazing bit of fast-paced wordplay. The most energetic and fun-to-watch performer in the film is Joan McCracken, who plays the man-hungry Babe Doolittle. Her performance of “Pass That Peace Pipe” is a highlight of the film. A very young Mel Tormé also shows up for a couple of songs, “Lucky in Love” and “The Best Things in Life Are Free,” so Good News is worth seeing if you’re a fan of The Velvet Fog. The song “Pass That Peace Pipe,” which was written by Ralph Blane, Hugh Martin, and Roger Edens, was nominated for an Academy Award for best original song, but lost out to “Zip-a-Dee-Doo-Dah” from Song of the South (1946). Posted in 1947, December 1947 and tagged Charles Walters, Joan McCracken, June Allyson, Mel Tormé, Metro-Goldwyn-Mayer, Musicals, Patricia Marshall, Peter Lawford. Bookmark the permalink. 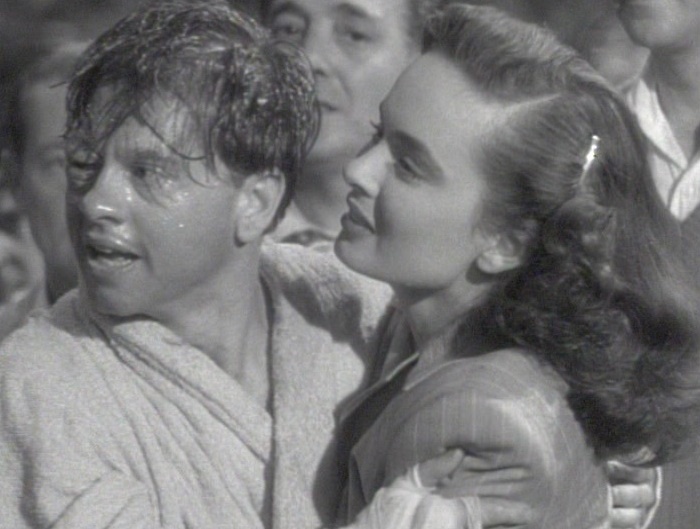 Nineteen forty-seven was the year Mickey Rooney turned 27, and the star of the Andy Hardy series and family fare like National Velvet (1944) was looking to stretch his range as an actor and step into more grown-up roles. Roy Rowland’s Killer McCoy is a remake of Richard Thorpe’s The Crowd Roars (1938), which starred Robert Taylor as a young pugilist named Tommy “Killer” McCoy who was caught between his no-good father and his gangland manager. Hopefully there’ll be a second remake next year starring former child star Haley Joel Osment. Maybe they could even throw in a drug-related in-ring breakdown, à la Oliver “The Atomic Bull” McCall, or a tawdry and mysterious death, à la Arturo Gatti. 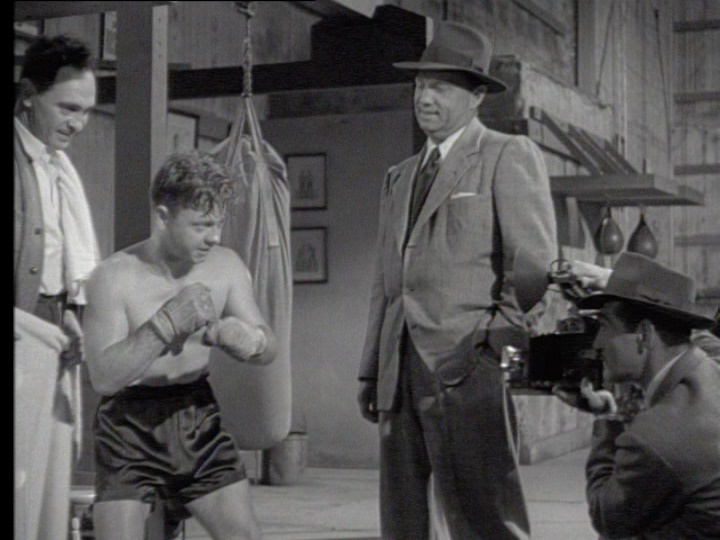 Killer McCoy isn’t a bad flick, and Mickey Rooney is pretty good in it, but it has the misfortune of being a boxing picture that was released right around the same time as Body and Soul, which is one of the best boxing pictures of all time. If you’re a fan of knock-down, drag-out fights, Killer McCoy does offer more punches per foot of film than Body and Soul. On the other hand, if the number of punches thrown was the only measure of a boxing film, then Rocky III (1982) and Rocky IV (1985) would be superior to Rocky (1976) and Rocky II (1979), and we all know that ain’t the case. Rooney is pretty convincing as a boxer. The filmmakers don’t try to shoot around how unbelievably tiny he is, so it makes sense that his character starts out fighting as a featherweight and moves up to lightweight. (Although I think in real life Rooney would probably have been more in the flyweight and bantamweight range.) The boxers he faces are mostly little guys, too, like Bob Steele, who plays a former lightweight champion named Sailor Graves. The supporting cast is generally good. I love seeing diminutive cowboy actor Steele in anything, and the same goes for Brian Donlevy, who plays boxing manager and fight promoter Jim Caighn. And actor James Dunn is great as Tommy McCoy’s drunken father, a former vaudevillian who clings to the past. The problem is not with the actors, but with the story, which never really allows its characters to become three-dimensional people. Caighn, the manager, is an especially egregious example. He has a double life as “Carrson,” a Wall Street tycoon who is far removed from the disreputable world of boxing. Caighn doesn’t want his daughter, Sheila Carrson (Ann Blyth), to know about his double life. This is all totally ludicrous, of course, and only exists to manufacture a stumbling block to Sheila’s romance with Tommy McCoy. 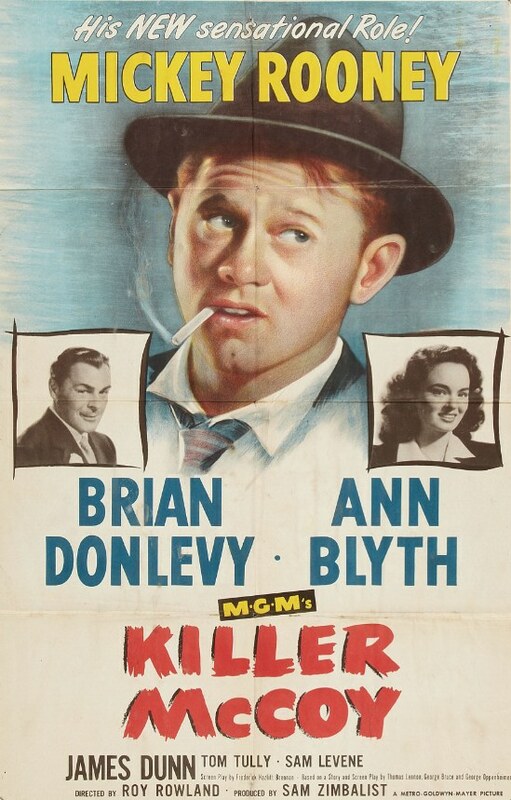 Killer McCoy is competently made and entertaining if you’re able tolerate Mickey Rooney, which a lot of people aren’t. Its boxing matches are well choreographed and action-packed. It’s no Body and Soul, but then again, what is? Posted in 1947, November 1947 and tagged Ann Blyth, Bob Steele, Boxing, Brian Donlevy, Drama, James Gunn, Metro-Goldwyn-Mayer, Mickey Rooney, Roy Rowland. Bookmark the permalink.